Summer has arrived and what better way to celebrate the dog days of summer than with this decadent Peanut Butter Fudge Ice Cream Cake? Growing up my mom always bought us ice cream cakes for our birthdays. I never realized until I was older that you could easily make your own ice cream cake. And let’s face it. We don’t need a birthday for an excuse to enjoy ice cream cake! 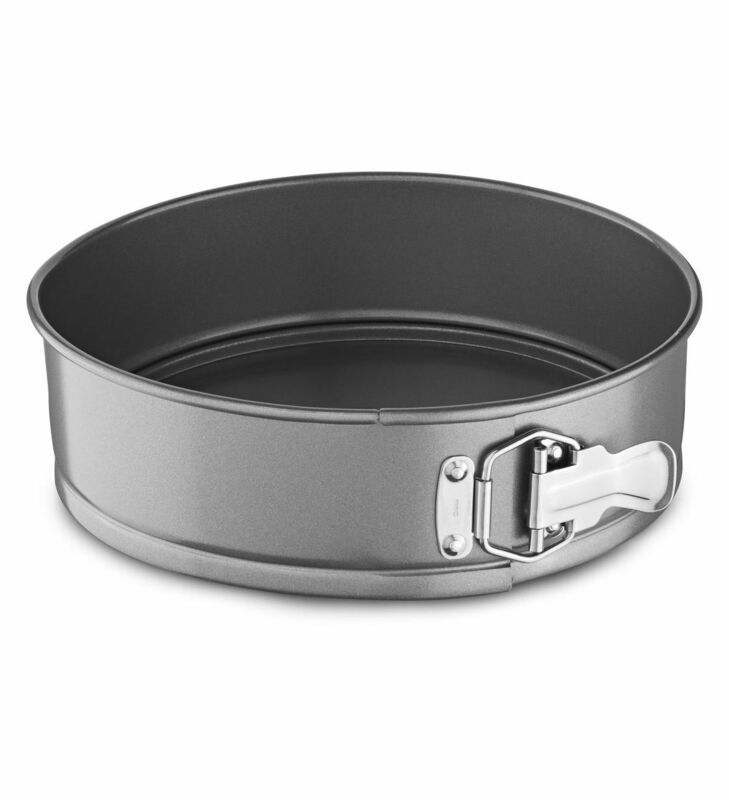 The ticket to making the perfect ice cream cake is using a KitchenAid® Nonstick 9″ Springform Pan. Typically the only time you need a springform pan is for a cheesecake, but I’ve found that the pan is much more versatile and works great when making ice cream cakes, too. 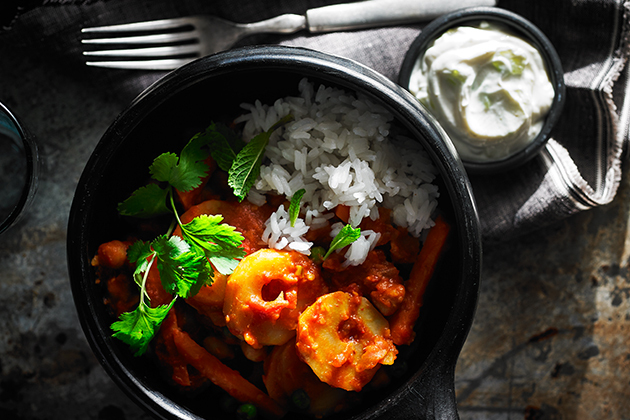 Be prepared to spend a few days on this recipe. 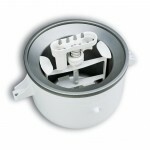 First you’ll want to chill your KitchenAid® Ice Cream Maker Attachment. 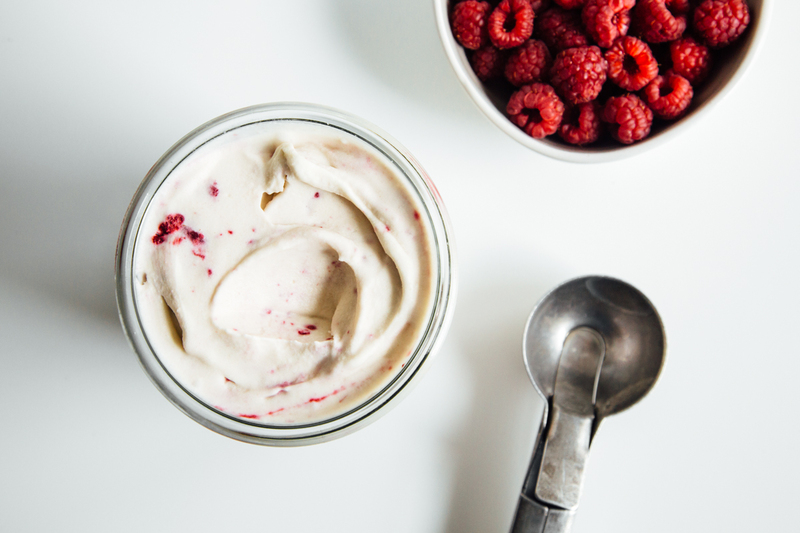 Then while it’s chilling in the freezer you’ll want to make your batter for the ice cream. First up, cream together the sugar, peanut butter, and eggs. While that’s mixing, simmer the half and half on the stovetop until it’s steaming but not boiling. Mixing it often is key. Remove the half and half from the stove top and begin to pour it into the KitchenAid® Stand Mixer bowl while churning on low. Mix for a good 30 seconds. Then pour the full mixture back into the pot and cook on the stovetop until steaming. This helps ensure that the yolk is cooked and safe to eat. Make sure you mix continuously to avoid the egg from cooking. If for some reason you see any forms of cooked yolk in the saucepan you can always strain with a fine mesh sieve. Pour the ice cream batter into food safe containers and place in the refrigerator, let chill for at least 8 hours. Pour the batter into the Ice Cream Maker Attachment and churn for 25-30 minutes. Once churned you’ll pour the soft ice cream back into the same containers that you chilled the liquid batter. No need to rinse out the excess or wash the containers! In the freezer it goes for 4 hours. Then once it’s still soft but not firm, it’s time to construct the ice cream cake. First up, crush the package of chocolate wafer cookies in a zip lock bag until you have small crumbs, and set to the side. Constructing is simple. Before you start constructing the ice cream cake make sure you have a towel underneath your springform pan incase any of the batter starts to leak. You’ll pour half of the ice cream into the springform pan. Then, place 5 tablespoons of hot fudge topping in dollops around the ice cream cake. Followed by a layer of crushed chocolate wafer cookies. A few more dollops of hot fudge topping on top of the cookie crumbs. Pour the remaining peanut butter ice cream into the springform pan, and add 5 more dollops of hot fudge topping. Then place plastic wrap on top and set in the freezer to chill for 4 hours. Before you remove the cake from the freezer you’ll want to make the whipped cream. Place the heavy cream and powdered sugar in the KitchenAid® Stand Mixer and mix until thick and fluffy. Then, using a knife carefully run it along the inside of the springform pan. Then carefully remove the springform pan. Using a cake icing spatula, begin to frost the cake with the whipped cream topping. 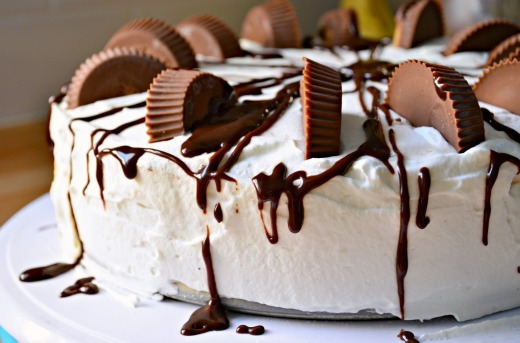 Once all the whipped cream has been applied to the ice cream cake cut peanut butter cups in half using a serrated knife and place around the cake. Then, stick the cake in the freezer for at least 30 minutes to set the cream and peanut butter cups. Heat the last of the hot fudge topping just until it’s warm and runny. Remove the cake from the freezer and sprinkle the hot fudge topping around the cake. Serve immediately or freeze until ready to enjoy. 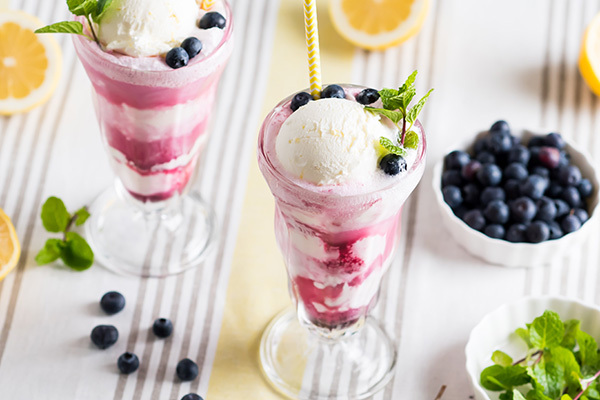 Place the KitchenAid® Ice Cream Maker Attachment in the freezer 24 hours before making this recipe. In a medium saucepan over medium heat, heat the half and half until very hot but not boiling, stirring often. Remove from heat and set aside. Using a KitchenAid® Stand Mixer and wire whip, cream together the granulated sugar, peanut butter, and egg yolks. Turn to speed 2, and mix for about 30 seconds or until well blended and slightly thickened. Continuing on speed 2, very gradually add half and half; mix until blended. Return the half and half mixture to medium saucepan; cook over medium heat until small bubbles form around edge and mixture is steamy, stirring constantly. Make sure you do not boil. Transfer half-and-half mixture into large bowl; stir in 3 cups of the heavy whipping cream and salt. Cover and chill for at least 8 hours. The next day (or 8 hours later): Pour the peanut butter ice cream batter into KitchenAid® Ice Cream Maker Attachment and churn for 30 minutes on speed 2. Pour the batter back into the containers and chill for 2 hours in the freezer until firmer. Before pulling the ice cream out of the freezer, in a large zip lock baggie place the entire package of chocolate wafers in the bag and smash them until they are fine crumbs. Set to the side. In a KitchenAid® Professional-Grade Nonstick Springform Pan, add 1 pint of the homemade peanut butter ice cream. Then dollop 5 tablespoons of the hot fudge topping on top of the ice cream. Pour the entire bag of crumbs into the springform pan, smoothing the crumbs out to one even layer. Then pour one and a half cups of hot fudge topping on top and carefully smooth. Carefully add the remaining peanut butter ice cream to the top layer. Add an additional 5 tablespoons of hot fudge topping on top of the ice cream. Cover the springform pan with plastic wrap, and place in the freezer for at least 4 hours. Just before pulling the ice cream cake out of the freezer you’ll want to make the whipped cream. 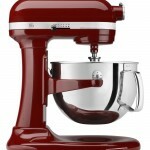 In the KitchenAid® Stand Mixer using the whisk attachment combine 1-cup heavy whipping cream with the powdered sugar. Start on 2 and gradually increase all the way up to speed 10. The entire process should take 2 minutes. Do not increase speed to 10 until the cream has started to thicken to prevent splattering. Remove the ice cream cake from the freezer. Run a serrated knife under hot water and cut around the edge of the springform pan to help loosen the cake. Remove the springform. Place the ice cream cake on an icing pedestal. Using an icing spatula, and begin to ice the cake using the whipped cream. Ice until smooth. Slice the peanut butter cups in half and place on top. Place in the freezer for an additional 30 minutes. Just before removing the ice cream cake from the freezer, warm the remaining hot fudge topping and drizzle over the top of the ice cream cake. Serve immediately or freeze until ready to serve.